In Part 1 of this series, we talked about the benefits of 401(k) plans (and some of the cons as well). These plans are probably the easiest programs to get started with since your employer should be familiar with the process of getting you signed up. A Roth IRA is another retirement vehicle to hold your investments such as stocks and mutual funds. However, there are some key differences between this type of account and a 401(k) plan. A 401(k) is employer-sponsored and can only be obtained if your employer offers it. A Roth IRA, however, is available to anyone with a few requirements. For instance, your modified adjusted gross income (AGI) needs to be less than a certain amount in order to contribute. In 2015, if you’re single, your modified AGI needs to be less than $116,000 and, if you’re married filing jointly, the number needs to be less than $183,000. More information on the limits can be found on the IRS website. Like a 401(k), there are limits to how much you can contribute to a Roth IRA. For 2015, the limit is $5,500 ($6,500 if you’re 50 or older). Check the IRS website for more information. The first benefit is one of my favorites – tax-free withdrawals. In other words, what you see is what you’ve got. If you remember, in Part 1, I talked about how sometimes you find yourself looking at how much money you have in your 401(k), but might forget at a glance that taxes will still be taken out of your withdrawals. This is because a 401(k) uses pre-tax dollars to fund it. With a Roth IRA, the tax man already cometh. The contributions you made were using dollars that were already taxed (most likely from your paycheck). So now you don’t have to worry about your tax bracket going up. You can have a much better notion of exactly where you stand with a Roth IRA. In Part 1, we talked about how it can be tough to get to your money in a 401(k) if you ever really need it (better be for an emergency!!). With a Roth IRA, however, the rules are a little different. You can withdraw your contribution at any time without penalties. The key word here is contributions – you cannot withdraw your earnings before age 59½. So if you’ve put in $50,000 into your Roth IRA over the years and it’s worth $60,000, you are allowed to take out that $50,000 penalty-free. Not something you want to do on a whim, but it definitely adds a sense of comfort knowing that you can get to your money if you ever need it without getting dinged. Yes you have some choices in which funds you want to invest in for your 401(k), but with a Roth IRA, the buffet is all yours to use as you see fit. If you want to invest in solid dividend stocks – go for it. Specific mutual funds… go ahead and make it happen. You can even invest in real estate using a Real Estate Investment Trust (REIT) – that’s not something you’ll generally be able to do in a 401(k). Unlike most 401(k) plans, with a Roth IRA you’re on your own! There’s no matching on this one. And believe me, with compounded growth, every penny you can get in your plan early is a big deal! This is one of the reasons why 401(k)s are considered to be the go-to retirement plans to utilize. Every penny counts and can really add up. 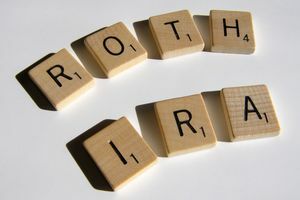 Roth IRAs aren’t the most tax effective because you’re paying the taxes on the money now instead of getting a little more with pre-tax dollars using a 401(k) that would be able to be invested and help the pot grow faster. There’s also the argument that you’re using dollars that have been taxed at a tax bracket that is likely to be higher than the one you’ll be in when you retire. In other words, with a 401(k), you skip being taxed now and hopefully when you are taxed at retirement, you won’t be working. That means you would likely be in a lower tax bracket and pay less in taxes. However, with a Roth IRA, you’re using dollars that were already taxed (likely through your paycheck). The thought is that that’s a waste of money. Personally, I don’t know what the future holds and if I’ll be making more money later in life, or if the government will change the rules, etc. I’d rather just get it done and over-with and know how much I have in my account. It usually makes sense to invest in your 401(k) up until your match. Once you’re putting that into your 401(k), put whatever else you can into a Roth IRA. Not only does that ensure you get a match on your money, but it also helps to hedge against future tax brackets since some of your distributions will be taxed at today’s tax bracket and some at the bracket you’re in for retirement. 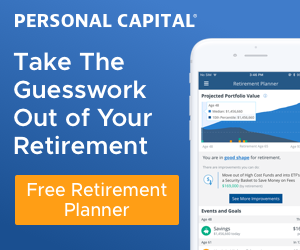 As I mentioned before, I currently put the maximum allowed by law into my 401(k) every year – but that’s because of the unlimited match that is offered at my company. If I didn’t have that good match at work, I would rather push everything into my Roth IRA. I’m currently putting about $2,000 into my Roth IRA every year. On the flip side, my wife’s employer only matches 3% on her 401(k) so that’s all we’re doing with hers. Right now, she’s only putting $25 a month into her Roth IRA, but we’re planning on increasing that now that her car is paid off. You can signup for a Roth IRA through a number of different channels, but usually your best bet will be to use a discount broker such as Scottrade, E*Trade, TD Ameritrade, or Vanguard. My accounts are with TD Ameritrade in case you’re wondering. As a side note, you generally don’t want to open a Roth IRA at your bank due to higher costs they usually charge that will really eat away at your nest egg. And finally, I strongly recommend you automate Roth IRA contributions – schedule your broker to automatically pull X number of dollars from your checking account a day or so after each payday to go into your Roth… pay yourself first. It’s much easier to contribute the money if you don’t have it available to spend elsewhere. In Part 3, we’ll talk about the newer Roth 401(k) plans and how that can really be the sweet spot if you can get it. I looked into using my ROTH towards a house down payment, but you can only put back in 5500/year to ‘repay’ yourself. That wasn’t going to work for me so I decided to not touch it for now. I agree wholeheartedly with your approach, but to me, I think all that’s important is that you’re contributing. Yes, you might be able to do a little better with your money or save a little here or there, but for the most part, contributing is the biggest part of the battle. I think it’s fantastic that you throw in your bonus every April!